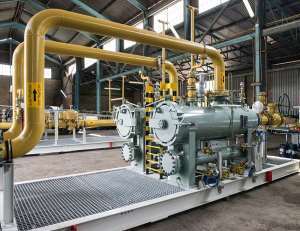 [Johannesburg, 4 April 2019]: Leading supplier of high-end and specialised equipment to the oil and gas industries in Africa, Energas Technologies, has successfully commissioned a fuel gas receiving station for a new 340 MW power plant in the coastal city of Tema in Ghana. According to HP van Huyssteen, project engineer at Energas Technologies, the power plant has been designed to run predominantly on natural gas, but also on distillate oil and light crude oil. The fuel gas station takes natural gas from the nearby pipe network and treats it before delivery to the plant’s gas turbines. The turbines require clean filtered gas to be delivered at a certain pressure and at a temperature high enough to avoid the formation of condensates. This was achieved by installing five prefabricated, factory-tested skid units, each with a different function. “The station’s inlet filtration skid removes solid particles and condensates from the gas stream. The second skid utilises a high-accuracy ultrasonic flow meter to measure the plant’s gas consumption. The third and fourth skids (in a duty run and standby run configuration) are indirect waterbath heaters that heat the gas to the desired temperature,” explains Van Huyssteen. The station’s outlet skid comprises pressure regulators and slam-shut valves that control the outlet pressure, provides over-pressure protection and offers emergency shutdown functionality. A separate packaged control room monitors various process parameters, provides feedback on the status of various equipment and offers a user interface for the station’s operators. The commissioning activities involved verifying all instrument loops, testing all safety systems, verifying the accuracy of the flow meter, commissioning the waterbath heaters and correct adjustment of the pressure regulators and slam-shut valves. Nitrogen was used to purge the piping to an acceptably low oxygen concentration prior to the introduction of natural gas. “It is vital that a station of this nature is meticulously commissioned due to the potential hazards involved in the event of a catastrophic failure. The station is designed to run unmanned, with minimal operator intervention, which makes it even more important to verify all safety systems and to install reliable and trusted equipment. Energas provided on-site practical training to the plant operating company’s personnel,” says Van Huyssteen. The station has passed the first phase of commissioning and the second stage will be performance testing once the power plant is ready to receive gas.